Siding – WSR Construction Inc.
We do not advertise one brand, one logo, one feature of siding materials. We work with all of the siding brands to fit the customer’s need the best. Over the years of experience, we have identified and noticed a number of features for each type or brand and today we can proudly give you the best opinion being independent from any manufacturer. One of the main reasons homeowners want to install vinyl siding is because it is long lasting and durable. Vinyl siding can stand up to most weather conditions without worry of severe damage. Newer vinyl is even stronger than the older versions and is less likely to crack and become brittle. In addition, vinyl siding can withstand years of sunlight without fading. Over a long term, vinyl siding can be cost effective. Vinyl siding is less expensive than repainting and repairing wood on a home. The initial cost of vinyl siding will vary depending on the size of the home and the quality of the siding. Vinyl siding comes in many grains and thickness that will affect the total cost. Some also believe that vinyl siding can help reduce energy bills by serving as an extra layer of insulation. Vinyl siding is easy to maintain. There is no need to paint the siding and it never fades from the elements. Power washing once or twice a year is the only regular maintenance that vinyl siding requires. Vinyl siding comes in many grains and colors to suit most homes. The good news about newer siding is that the color is baked through the vinyl instead of applied. This means that the color stays true over a long period of time and will not show scratches or small imperfections. 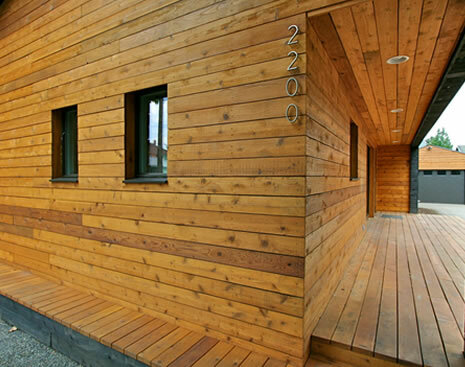 Cedar Siding is, above all, a wood of exceptional beauty. In its natural, unfinished state, it has a richly textured, tactile grain combined with a palette of warm, mellow tones ranging from light amber to deep honey brown. Cedar Siding also remains subtly aromatic, and the characteristic fragrance of cedar adds another dimension to Cedar Siding’s universal appeal. Aside from its beauty, the purely practical, dollars-and-cents value of the cedar siding offers other benefits: the cellular structure of the cedar siding creates interior air spaces that provide an insulation value higher than the most woods and much higher than brick or concrete. Buildings which feature cedar siding tend to stay cooler in the summer and warmer in the winter. Cedar siding also has excellent sound suppression and absorption qualities. Cedar Siding contains natural oils that act as preservatives to help the wood resist insect attack and decay. Cedar siding is also a dimensionally stable wood that lies flat and stays straight. Properly finished and maintained, Cedar Siding ages gracefully and endures for many years. 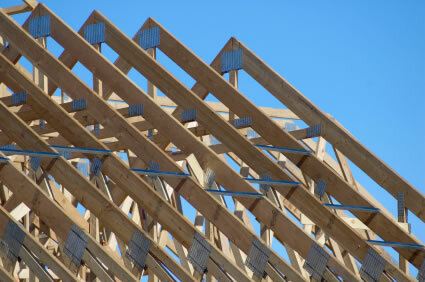 Fiber-cement building materials earn green points for durability. Fiber-cement, the new generation of what was once an asbestos-containing material, is today made from Portland cement, sand, clay, and wood fiber. 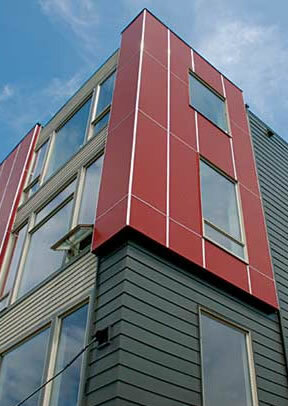 Most fiber-cement siding is available factory primed. It takes paint very well, and proper painting is important for long-term durability. Can be cost-effective when compared to a full-scale refurbishment of wood clapboard. It was my pleasure to have WSR Construction Inc. for siding replacement work of my mansion. I am very satisfied with the work done and quality. There are some of the manufactures, which products we install, but we do not limit ourselves to anyone, even if you already have your own materials, please call us to help you with installation. Fill out the form and we will get in touch with you promptly. Thank you for your interest!